Professor Ivo Babuška, the worldwide renown specialist in computational mathematics received the prestigious Neuron Prize for Life Achievement awarded by the Neuron Foundation for Support of Science and Research. He is the founder of two important departments of mathematical research in the Institute of Mathematics: partial differential equations and numerical analysis. Since 1968 he has been working in the USA. The Academy of Sciences of the Czech Republic organizes a meeting on the occasion of the visit of Jean-Pierre Bourguignon, President of the European Research Council. Jean-Pierre Bourguignon is well known for his contributions to modern differential geometry. He was the president of the French Mathematical Society (1990–1992), and the second president of the European Mathematical Society (1995–1998). Since 1994, and until his retirement in August 2013, he has served mathematicians and physicists all over the world as director of the prestigious research centre Institut des Hautes Études Scientifiques at Bures-sur-Yvette, close to Paris. Since 2014 he is the President of the European Research Council (ERC). The lecture will be followed by a panel discussion about the ERC and mathematics in the Czech Republic. On June 24-26 the international workshop Rate independent processes and evolution - RIPE60 was organized in the Institute of Mathematics AS CR by Eduard Feireisl (Prague) and Elisabetta Rocca (Berlin) on the occasion of 60-th birthday of RNDr. Pavel Krejčí, CSc. The workshop was attented by more than 30 of his collaborators and co-authors from different countries. Part of the workshop was a ceremony where the President of the Scientific Council AS CR, Prof. Jiří Čtyroký, handed to Pavel Krejčí the Honorary Bernard Bolzano Medal for Merits in Mathematical Sciences, awarded by the Academy of Sciences of the Czech Republic. Prof. Jürgen Sprekels, director of the Weierstrass Institut für Angewandte Analysis und Stochastik in Berlin, Pavel's friend and collaborator, delivered the laudatio. Tradiční Dny otevřených dveří v Matematickém ústavu AV ČR jsou součástí Týdne vědy a techniky Akademe věd ČR, nejrozsáhlejšího vědeckého festivalu v České republice pořádaného Akademií věd ČR ve spolupráci s dalšími institucemi ve dnech 1.–15. listopadu 2014. Široká veřejnost a především studenti středních škol mají možnost nahlédnout do pracoven, laboratoří a knihoven a poznat, jak se dělá věda. Badatelé z výzkumných pracovišť AV ČR připravují širokou nabídku exkurzí, přednášek, výstav a diskusních večerů, ve kterých představují své výzkumné projekty, předvádějí nejmodernější vědecké přístroje a experimenty a přibližují návštěvníkům nejnovější trendy v oblasti vědy. V Matematickém ústavu AV ČR se Dny otevřených dveří uskuteční na pražském pracovišti ve dnech 12.–14. listopadu, v brněnské pobočce 4. listopadu 2014. Traditional Open Houses in the Institute of Mathematics AS CR will be held as part of the Week of Science and Technology, the most extensive scientific festival in the Czech Republic, organized by the Academy of Sciences of the Czech Republic in cooperation with other institutions from 1st to 15th November 2014. The scientists from the research workplaces of the Academy of Sciences prepare a wide offer of lectures, presentations, panel discussions, seminars, excursions, exhibitions and discussion evenings, in which they present their research projects, the most modern scientific apparatuses and outline for the attendees the latest trends in the areas of science in the Czech Republic and the world. The Prague departments in the Institute of Mathematics will be open to public from 12th to 14th November, the Brno branch on 4th November 2014. During the first day of the International Congress of Mathematicians in Seoul the prestigious prize winners have been announced. We are proud to have Martin Hairer in the Editorial Board of the Czechoslovak Mathematical Journal. Congratulations! For more information see the ICM News. 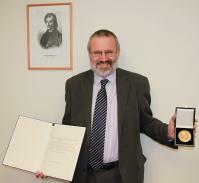 The Czech Mathematical Society awared the Honorary Medal to Professor Alois Kufner for his lifelong contribution to the development of the Czech mathematics and of the Union of Czech Mathematicians and Physicists. Professor Kufner was among founders of the Czech Mathematical Society and represented Czech mathematicians in the European Mathematical Society as a member of its first Executive Committee. The aim of the mini-workshop organized in the Institute of Mathematics ASCR from 17 to 21 December 2014 is to bring people working in various areas of algebra, logic, and functional analysis. where similar tools and methods are used. The European Mathematical Society Council elected Prof. RNDr. Pavel Exner, DrSc., from the Institute of Nuclear Physics ASCR the new President of the EMS for the period 2015-2018. One Ph.D. student position is available in the Institute of Mathematics. See section Positions and the electronic applications system. The Ph.D. students in the Institute of Computer Science AS CR and the Institute of Mathematics AS CR organize a workshop where the students will present their research results, exchange ideas and get an instant feedback about the content and form of their presentations. The workshop is supported by both institutes. The Norwegian Academy of Sciences and Letters calls for nominations of candidates for the Abel Prize 2015. The Abel Prize recognizes outstanding scientific work in the field of mathematics, including mathematical aspects of computer science, mathematical physics, probability, numerical analysis and scientific computing, statistics and applications of mathematics in the sciences. Nominations should be submitted by September 15, 2014. 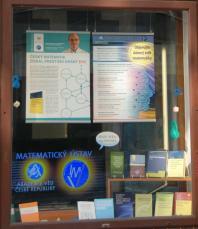 A shop window of the Academia Publishing House in Prague, Vodičkova Str. 40, has been used for popularising mathematics during July. On the display there is a selection of recent achievements of the Institute and a screen showing a series of interesting short films on mathematical themes. The conference organized in four years intervals together with the General Assembly of the Czech Mathematical Society is organizaed from 5th to 7th June in Pilsen. RIPE 60 is a workshop on rate independent processes as well as related mathematical problems and their application. The workshop is held on the ocassion of 60-th birthday of Pavel Krejčí. See the poster, the programme, the abstracts. An informal full-day seminar to gather mathematicians working in topological aspects of functional analysis is organized by Vladmír Müller, Jerzy Kąkol and Wiesław Kubiś in the Institute of Mathematics on 15 April 2014. See the programme.